Calgary, Alberta - The St. Simeon Church School congregation was founded in 1969 wih the blessing of Bishop Sava. Since then many successes and much growth has occurred in this humble community. A chapel was built in the early 1970s and in the mid-1980s a church was built, and finally in 2014 the current church was consecrated and the the piece of land which is a part of our holy Serbia in faraway Canada. On the feast day of St. Tryphon the Martyr another significant and most joyous event occurred in this community. Namely, His Holiness Serbian Patriarch Irinej visited this church school congregation. The Patriarch, acoompanied by V. Rev. Stavrophor Vasilije Tomic, the Episcopal Deputy and Protodeacon Damjan Bozic, arrived in the evening hours of February 13h. At the airport they were welcomed by Prota Obrad Filipovic, the Dean of the Western Canadian Deanery, together with the church board and faithful people. After the heartfelt welcome the guests visited the church after which a meeting of the church board was held in the church hall. Dinner followed, prepared by Zika Pavlovic and his family. His Holiness also met with the delegation from the church school congregation of St. Sava in Vancouver. 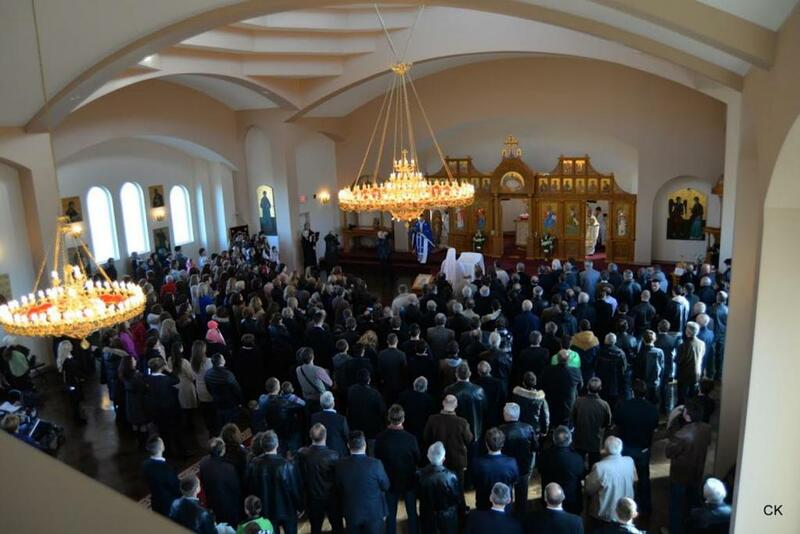 On Sunday February 14, 2016, Patriarch Irinej celebrated the Divine Liturgy with the concelebration of V. Rev. Vasilije Tomic, V. Rev. Desimir Vidovic, Fr. Vasila of the Georgian Church, V. Rev. Obrad Filipovic and Protodeacon Damjan Bozic. In his homily His Holiness stated that he was joyous that he was given the opportunity to serve in this beautiful church dedicated to St. Simeon the Myrrh-flowing, the source of the holy Nemanjic vine. "The greatest adornment to the church are the people who fill it," the patriarch said stating that the church should be filled every Sunday and feast day. Prota Obrad Filipovic greeted the Patriarch, the clergy and faithful and thanked His Holiness noting that generations of Serbs will speak of this day which the Lord created that we rejoice and be glad in it. A banquet was prepared in the church hall after the Divine Liturgy. The agape meal was prepared by the Kolo Srpskih Sestara. His Holiness travelled to Ontario, granting his blessings on the people of Vancouver, while the faithful were strengthened by the joy which they felt remaining faithful to their Mother Church, their Patriarch and Serbian people.